Mitchell County Ag News | To Spray or Not To Spray? With Friday’s heavy rain and the arrival of budbreak, pecan growers are anxious about getting their first fungicide spray on to protect the foliage from pecan scab. At this point, the only pecan variety growers should be concerned about is ‘Desirable’. Most varieties that have budded out very far to this point are less susceptible to scab and as a result there is less of an urgency to get those covered. If ‘Desirable’ is to the point that the leaves are beginning to unfold and you are located in a scab prone area (below 300′ elevation or surrounded by woods), it may not be a bad idea to spray this week. 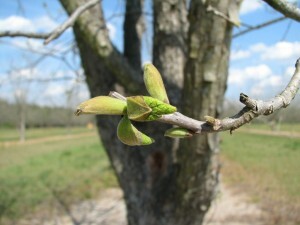 If the leaves are still tightly enclosed in the form of a swollen bud or you are in an area with good air flow, I would hold off at this point. For most other varieties, especially Stuart, which is further behind in its progression of bud break, there is no need to spray just yet. While we had significant rain Friday and there is a chance of rain one night this week, low temperatures are forecast to remain in the mid to low 40’s, especially toward the end of the week. The optimum temperature range for scab infection is 59-77 degrees F and a leaf wetness of about 12 hours. If the cooler weather last week and this week slows down the movement of budbreak, it will likely slow down scab as well. Except for ‘Desirable’ in the situation described above, I would plan on waiting until next week to begin scab sprays in most areas of the state. For examples of proven fungicide programs to consider see the previous links here and here. Next: GA Farm Monitor: Mitchell County Cotton Production Meeting!